Organizing a meetup group, I’ve discovered, is a good way to find new things to worry about. 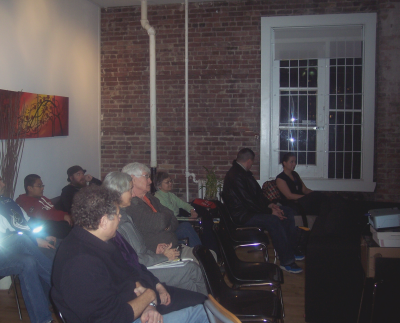 When I first started the Northwest Coast Art Meetup Group in Vancouver, I worried that no one would show up to the first meeting. I tried to minimize the worry by asking artist and dancer Mike Dangeli to be the first speaker. Then Mike sent out an invitation to all his Facebook friends, and I worried whether the space I’d booked – the lobby of The Network Hub – would be large enough for everyone who said they planned to attend. However, I shouldn’t have worried (although I did, of course, being the sort of person I am: About whether the third floor of a building without an elevator was too high for anybody, or too inaccessible; whether the food that co-organizer Nathan Bauman brought would be eaten, whether everybody enjoyed the talk; you name it, and I worried about it). 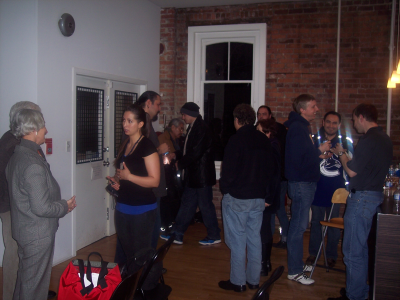 I counted eighteen at the meetup’s first event yesterday evening – fewer than I had expected or feared, but better than most first meetup events can manage from what several people told me. I suspect that predictions of snow kept the numbers down. 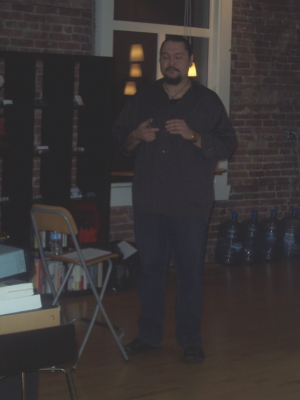 Mike had agreed to talk about “Art and the Potlatch.” It’s a subject that he is well-equipped to discuss, having given fifteen potlatches, and given away hundreds of thousands of dollars in art at them. I knew in the abstract the importance of potlatches in First Nations cultures, and the importance that art played in them. However, it is one thing to understand something in theory and entirely another to see overwhelming proof of it. As Mike talked, I gained an appreciation of the wide variety of events covered by the term. Births, puberty, betrothal, marriage, the assumption of titles or responsibility – listening to the passing mentions of all the different occasions, I appreciated in a way that I hadn’t really before just how many rites of passage were contained within that simple word from the Chinook jargon. A single word didn’t seem enough to cover so many different occasions. In fact, it occurs to me that this poverty of expression helped to hide just how devastating the banning of the potlatch from 1884 to 1951 actually was – and why they continued to be celebrated in secret. The same missionaries who urged the banning of the potlatch would have been outraged had anyone tried to ban their own baptisms, marriages and funerals. Yet either they didn’t notice or they didn’t care that that was what they were doing by passing the anti-potlatch legislation. Another impression I took from Mike’s talk is how closely the art of the coastal First Nations is connected to these rites of passage. Not only the amount of art given, but the sheer variety – paintings, hats, masks, robes, jewelry, dancing regalia – on Mike’s slides impressed this point. Since that was what I hoped would come from his talk, I was glad to feel that realization sinking into me, and I hope that others at the meetup did as well. I didn’t want the group to be a bunch of dilettantes, but to provide a real understanding of the art’s roots and connections – and there’s no doubt that Mike started the meetings off the right way. No one had any questions at the end, but few were in a hurry to leave, either. Most stood talking for the next forty minutes, and seemed enthused by what they had just heard. One or two, who were artists themselves, or the recent recipients of gifts, showed their own pieces of art. Many thanked me for starting the group. I’d call the evening a moderately successful beginning. Now, I want to arrange the next event, and see if a bit of a community can’t be organized from the group. Sometimes when I have a spare moment, I browse the Geek Feminism web site. Often, it doesn’t tell me anything I don’t already know, but it almost always gives details that help to broaden my understanding. However, one issue caught me completely by surprise: the verbal and physical intimidation and abuse of women on the street. My first reaction to evidence like a Google map of where one blogger had been harassed in San Francisco was disbelief. For the short period the map covered, it showed at least daily incidents, sometimes more.Catcalling, staring and sizing up, unwelcome innuendo and sexual invitations, being forced off the sidewalk and otherwise physically threatened — if you can imagine a petty piece of nastiness, it was described in the first hand accounts that I read, and I wanted to disbelieve it. Could such behavior really be so prevalent? But the comments whenever someone blogs about this issue and the responses of various women I know rapidly convinced me that, if any hyperbole existed in the accounts, it was not enough to change the basic truth. The degree and frequency might vary from city to city, or from woman to woman depending on what they were prepared to endure, but such things really were a common part of many women’s lives. Needless to say, I was shocked. But I was also left feeling naïve and wondering how I could have missed this basic fact. So much, I thought for the powers of observation on which I pride myself. How could I have missed something so obvious? Another reason for my ignorance may be that many of these actions apparently take place where no witnesses are about. The type of man who would accost a woman on the street would not want witnesses, especially another man, who might respond aggressively. Of course, some men in groups also make life difficult to passing women, but I wouldn’t see that, either, because I rarely hang out in all-male groups, and wouldn’t linger in one that would find amusement in making women miserable and uncomfortable. Or so I would like to think, anyway – a revelation of this kind leaves me wondering if I would know whether friends acted this way or not. However, I suspect that the main reason I never imagined the extent of this behavior is that it is utterly removed from what I would consider proper behavior. It’s not that I don’t notice attractive women. Like most men and women, I am well aware when I am in the vicinity of a good-looking person of the gender that I’m attracted to – it’s just that I consider it rude to impose my passing interest on them. I can easily imagine how little I would welcome such attention intruding upon me and my concerns, so I don’t inflict mine on others. Instead, I observe and appreciate quietly, and without obvious or extraordinary efforts to do so. To do otherwise would be a form of rudeness, like stepping too far into someone’s personal space or touching them unnecessarily. To call out on the street, or to deliberately make someone uncomfortable just wouldn’t occur to me. I suppose I am guilty of egocentricity – of assuming unconsciously that the way I ordered my daily life was the way that everybody did. Could I have failed to see this kind of abuse going on around me simply because I did not think to look for it? Worse – was there ever a time when I could have done something against the abuse, if only stood and glared, but didn’t because I didn’t notice what was going on? I can only hope not, but the possibility seems all too likely. I’m left feeling appalled and humbled – and worrying what else is going on around me that my expectations and assumptions leave me oblivious about. “Octopus Eating a Cockle Clam” is an argillite rattle, with abalone eyes. The rattle itself is a clam shell with broken shell inside and surrounded by a web of red cedar made by weaver Maxine Edgar. Leather wraps the handle of a rattle, which rests in an argillite base. Although the top of the base has a simple salmon-eye design, the rattle as a whole is a naturalistic rather than a formline design – an approach you sometimes see in historic argillite pieces, but rarely see in modern work. All eight tentacles are present, and, if you look closely, you can see the striations of muscle along the tentacles, and the lines of suckers where the underside of the tentacles are visible. The imitation of life is not total, giving way to artistic considerations in such details as the roundness of the head, the abalone eyes, and the darkness of the argillite, but in general the realism is much greater than you normally find in Haida art. There is realism, too, in the general concept of the rattle; an octopus actually does crush clams and other shellfish in the way that the rattle depicts. 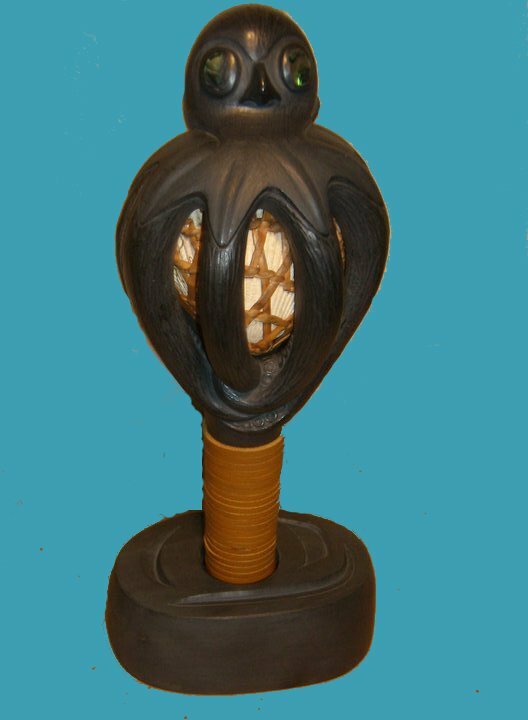 Once you see it, the idea seems simple and ideally suited to the shape of a rattle – yet, so far as I have been able to find, no other artist, historic or contemporary, or in any medium has seen the analogy except Minaker Russ. The day that I bought it, he showed it to several passing Haida friends, and not one failed to exclaim about how unique the design was. Another important aspect of “Octopus Eating a Cockle Clam” is the fact that it is mixed media. Viewing Northwest Coast Art, it is easy to forget that what you see would have been historically a part of everyday life. However, the fact that this piece is not only a functional rattle but also includes a staple seafood and the work of another artist firmly embeds it in the culture that it comes from. The connection is all the stronger because, according to Minaker Russ, the clam shell was picked up on North Beach near Masset on Haida Gwaii, which is traditionally the place where Raven discovered the first people in a shell. Historically, the shell was not a clam until Bill Reid depicted it as one, nor did Reid depict a cockle shell; yet, all the same, to a modern audience, the clam shell emphasizes the cultural connection. I admit to a certain guilt at buying a functional rattle that I will only shake gently from time to time, for fear of breaking the shell. But, aesthetically and culturally, “Octopus Eating a Cockle Clam” is a piece I feel privileged to see every day. It naturally draws the eye, so I’ve given in to the inevitable and positioned it on the focal point of the living room, where it belongs.